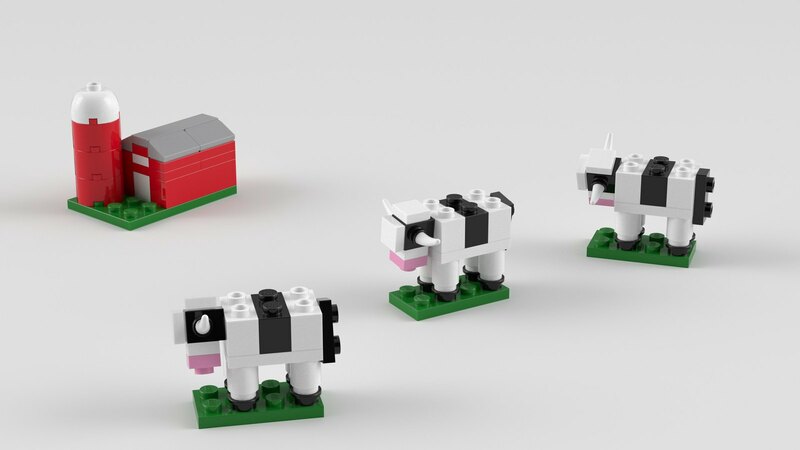 Add a little country to your collection with this cute mini build set. I follow a number of LEGO sites through RSS feeds, looking for inspiration on what to render next. A long time back, I booked marked this article, Build the Big E Cow. It was small, had instructions, and was kind of cute. Something my wife would like. I booked marked the site, thinking someday I’d get back to it. I finally did. Cleaning out my reading list, I ran across it again. Skipping LDD, I jumped straight to Mecabricks and quickly had the Big E cow built and ready to render. But, before I did, I dug back through article and noticed a particular comment with a link to different instructions. Apparently, the set is an official mini build from the LEGO club. Even cooler, this version had a little barn as well. Jackpot. The barn was a bit out of scale with the cow, but still great. I downloaded the new instructions soon after had the complete done. Although the original link was in Danish, it was released in other countries. Here is the US version, MOOOOOVE TO THE COUNTRY!. The article even pokes fun at the size of the barn. When it came time to render the cow, I noticed a slight difference between the two articles. The Big E cow uses a flat plate nose, while the club version uses a stud plate. I decided to switch to the later for the Blender version. Oh, and I threw a few extra cows in for good measure. Not quite as nice as my own cow—yes, I’m biased—it’s still a great little build. Oh, and my wife did say it was cute.